Evidently quite a different playstyle from my own, but interesting to see what time, dedication, and a very different 'take' on things will produce. Tonight's story isn't very interesting and certainly isn't exciting, but at least it is short! I just wanted to get this written down as it is a fairly significant day in my world's history. I also make this post as something of an intermission between the first and second part of the "Shadowspire and the Twilight Watchtower" post. The first time I sought out a stronghold was in 2014. 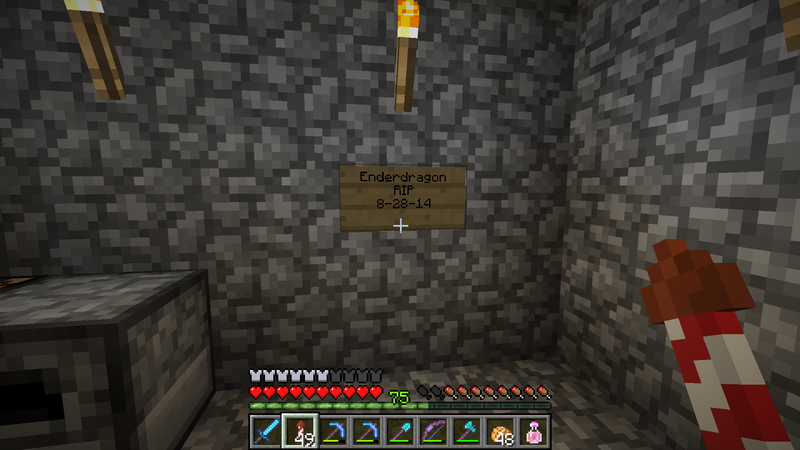 Very unfortunately, my records don't show it, but it was almost certainly Aug. 28, Dragon's Death, the day I first slew the Ender Dragon on this world, and only the second time I had ever done so on any world. The second time I raided a stronghold was April 23, 2016. At that time, I also established a small outpost above it, but not without being brought to half a heart while also poisoned and without any weapons after I suddenly fell through a river bottom and into pitch black darkness surrounded by monsters. Continued from post #5009 . . .
(Above) Pretty well sums it up. Can't see anything. I'm hungered and poisoned. I have no weapons on my hotbar. I hear the clatter of bones, moan of zombies, chitter of spiders, and the wicked, haunting laughter of a witch. This is not good. Tonight, I found the third and final (original) stronghold. Like the second one, this one was generated in version 1.8. I'm seeking the same thing as I was last time: library book shelves. This time, they're for the enchantment station in the Twilight Watchtower, which is undergoing heavy renovations as I make it a full-fledged base of operations. 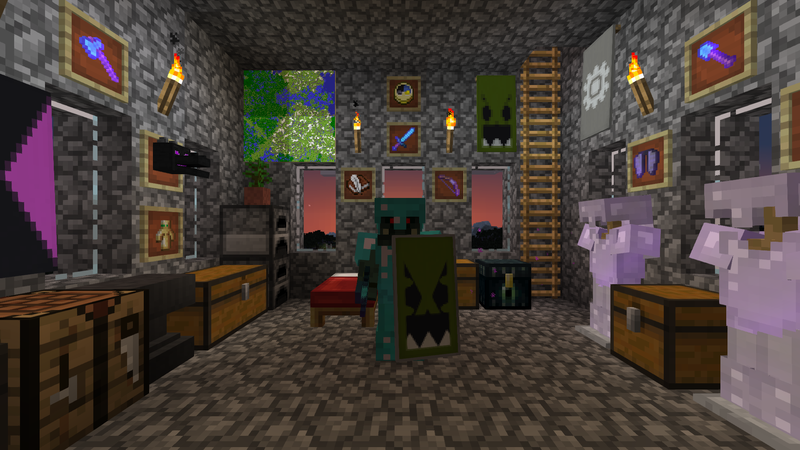 I don't want the bookshelves because I lack multiple double chests full of resources to craft them, but because I simply want bookshelves from a stronghold. All enchantment stations in Midgard are made from stronghold bookshelves. Of course it doesn't matter. Stronghold bookshelves are no different than any other. But, anytime I enchant a book, I know the bookshelves that surround me came from a stronghold. These aren't books made from sugarcane pulp auto-farmed by a robot minecart below the castle sandwiched between the hide stripped off a defenseless cow's dead corpse. No, these are otherworldly gimoires liberated from a labyrinth guarded by monsters deep beneath the the world. The banners are easily craftable; it's just light gray with a white daisy. Unfortunately, it's plain, ugly, and contains no rare materials (like a creeper head, Notch apple, or even a wither skull). However, each of the decorations on display in Old Tower is a piece of memorabilia or a trophy of some sort. The banner would be of no value at all to me had it not been taken from a Woodland Mansion—that is the entirety of its worth. Now, when I look at it, I can say, "I found a mushroom island between here and the Woodland Mansion that banner came from." Unlike the first and second stronghold, the trip to this one and the search for a library once inside went without a hitch. That doesn't make for a legendary tale . . . but it is what it is. (Above) I started out at the Twilight Watchtower. I was worried that after having found two other strongholds, the eye would wander toward one of those making it difficult, but it ended up being the easiest to find yet. It took six eyes to find. I don't know if that's many or few. 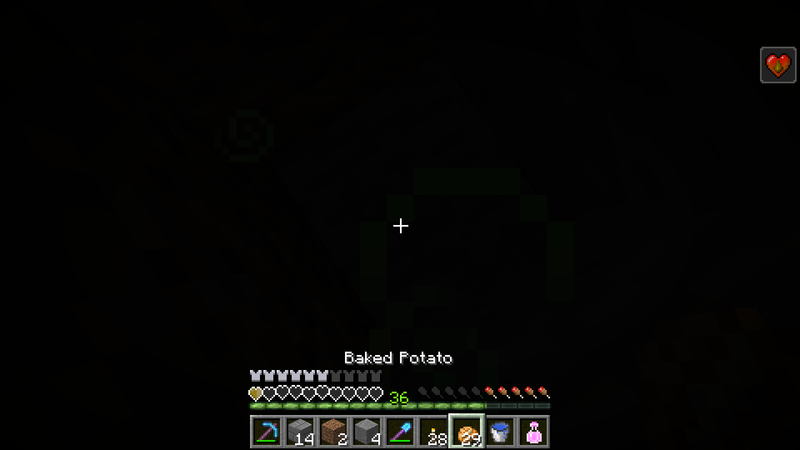 I have multiple double chests full of pearls and blaze rods, so it didn't really matter either way. (Above) The eyes led me to a spot beneath that plains-colored swamp oak in the Brinemire Swamp. The Brinemire Grotto base isn't far to the right (west) of the screenshot. Those are the Olympian Mountains jutting out of the horizon to the south. I'm standing atop the Witherfell Mountains, named after the underground base to the north, the place in which I've killed all three Withers. (Above) For some reason, I was surprised to see an oak door in a stronghold. As this world is locked in hard difficulty, I would never put a wood door in a place where zombies could tear it down. I realize that the stronghold designers don't share my concerns—it just struck me. In my opinion, spruce would look a lot better than oak in a Stronghold. (Above) Here's what I came here to find! It took less than five minutes. (Above) All the books have the same enchantment thanks to an old bug. Absolute garbage. After Witherbane, the max-enchant sword I use solely to kill wither skeletons and the Wither, I'll never again put Fire Aspect on a sword—not because it affects drops, but because the fire rarely does significant damage. However, at the same time, flaming mobs become a much greater threat to a player in melee. I wouldn't put Flame on a bow, either, but the tracer-like effect on arrows in flight balances its impracticality, and monsters out of melee range on fire are no more dangerous. Plus, they're easier to see. As for Lure, I have multiple max-enchant fishing rods, though I don't think I'll ever lose the first, "Lucky," due to Mending. While I said the whole trip went without a hitch, I did manage to forget my Silk Touch axe back at Castle Midgard. So, I had to fly back there and fetch it. With rocket-powered elytra, it took less time to do that than use my pick to collect the shelves. The axe came out of an End city chest with "just" Silk Touch and Efficiency IV. As there's no difference (lacking Haste II) between Efficiency IV and V on an axe meant only for use on bookshelves, and as it's in no danger of running out of durability for the next ten decades, I never maxed out its enchantments. Just no need at all. The regular axe I carry is called Arborcide and is enchanted with Sharpness V, Fortune III, Mending, and Unbreaking III. (Above) I only harvest the shelves in the center. I always leave the ones set in the walls. If times get tough in a couple years, I may change that policy, but it's more likely I'll strike out in search of a new stronghold many kilometers from home. If you read through all of that, congratulations, you've reached the end! …these are otherworldly gimoires liberated from a labyrinth guarded by monsters deep beneath the the world. Many a DM could benefit from learning to construct sush descriptions….